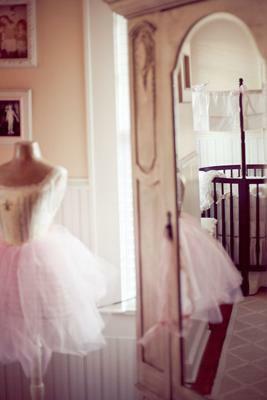 My ballerina dancer nursery was inspired by the dance photographs of my daughter's aunts and grandmothers. MOST of us have pictures of us dressed up in some kind of dance outfit and I wanted to pull those elements into my daughter's room. Martha Stewart Gingerroot is the main color of the walls and I used some colors from her precious metals line on the ceiling mural. I hired a mural artist to do the clouds on the ceiling (I'm not artistic enough to create them myself). I found a piece of wallpaper that I wanted to re-create and he did an AWESOME job. I have ALWAYS wanted a round baby crib but thought I wouldn't be able to find one that wasn't ridiculously priced. Imagine my surprise when I found this one at WALMART!!!!!!!! I bought some pieces at Buy Buy Baby and then bought an antique armoire and end tables off craigslist. 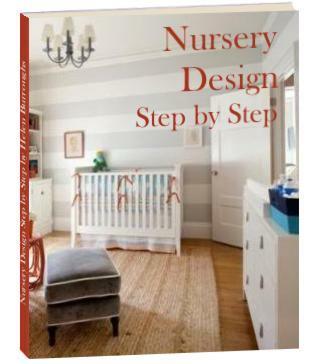 I ordered Pretty Pique round crib bedding from ababy.com. Again, usually round is just ridiculously priced. This was still more than something I could buy in my local baby stores, but it was so worth it to me. It's gorgeous. your window treatments, lighting, rugs, wall decor and accessories. Where did you buy them - were any handmade? The mannequin was custom made for me by an AMAZING lady on Etsy. I told her what I wanted and she did just an awesome job. My husband is from Louisiana, so he loves Fleur De Lis. We worked that into her bodice. I just love her to pieces. My daughter's name is Emmeline Cosette, so we named this lovely lady mannequin "Cosette". I have lots of drawer space, so mostly there. It took me a few months to see everything come together. I had so much fun creating this room for my daughter. I think it's just gorgeous. My husband and I usually brainstorm together and he's the one that insisted on clouds on the ceiling. I couldn't stomach plain vanilla blue with white puffs so we settled on the gold color scheme. I couldn't have done it without him. The wall with the dance pictures of her female relatives. It's such a neat way to pull family into the mix. I can't imagine a more perfect room to rock my gorgeous little girl to sleep. Here she is! She's amazing! How can I find the women on Ebay who made this? I would love to have one made.